The enigma of travel in the highlands has driven tourism for generations. Tales of intrepid travellers staying overnight in dramatic landscapes fill the pages of Boswell and Johnson’s diaries, Queen Victoria’s travel journal and Sir Walter Scott’s romantic fiction. Visitors expect overnight stays in buildings that allow them to sense the unique nature of their location alongside the Caledonian Canal. The pods are inspired by the box beds used in highland croft houses which are micro ‘rooms’, containing just the bed, with vertical sides, a lid and wooden doors to completely internalize the space. Box beds are somewhere between furniture and architecture, and represent the special qualities of compactness, efficiency, and introversion you experience when staying in a snug, croft house or bothy. The cabin’s simple cubic form is disrupted by creating a pitched roof with a diagonal ridge. The charred Scottish larch timber jacket is detailed with semi concealed gutters and aluminium trims to give the illusion of a solid object. In contrast, the interior white limed timber.. 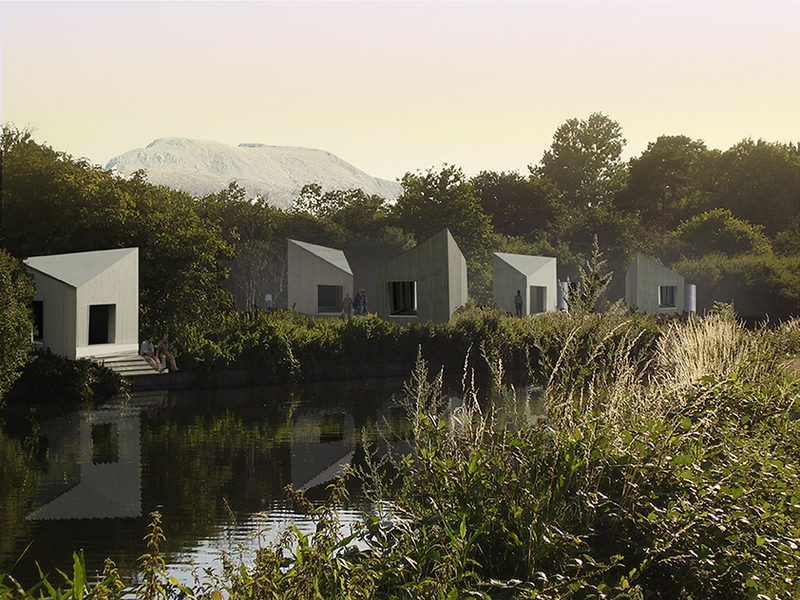 Commissioned by Scottish Canals and working with Richard Heggie, Urban Animation planning consultant, the camping pods are to be sited in clusters at carefully selected locations along the route of the Caledonian Canal. The first two are at Laggan Lock next to the facilities building designed by young architects Sean Douglas and Gavin Murray in collaboration with us. This was one of the Scottish Government's National Scenic Routes commissions - an initiative that addresses the scarcity of opportunity for young architects in the current climate of risk averse public procurement.